Ryla is one of the youngest people on the Reiko-10 base, and one of the only survivors of the officer corps. Her mental skills are prodigious, but mostly unhoned which was why she was assigned under Zaire on what was supposed to be a routine assignment. Ryla is an extremely talented woman that was engineered to be a communications officer on starships. Trained in a multitude of common alien languages, and computer comm. programs; her overt skill in these matters as she was growing up was obvious. Additionally, a more subvert training she received was the subtle manipulation of words and tones to achieve the desired result for any diplomatic exchange. For being so highly looked upon by her teachers, what happened next came as a surprise to anyone who might have not known Ryla better. Throughout all of her training she had a steady boyfriend who was in a concurrent program of weapon officer training. Their short free time was often spent together, and for the duration of training they seemed inseparable. Eventually, Ryla noticed that despite her one hundred percent effort she was putting into the relationship, she noticed a distance and rending that was occurring between their relationship. This continued on for a long time, progressively getting worse, until Ryla had suggested they go out as a last ditch attempt to save their relationship. He agreed, and the time was set. The time approached in a slow fashion, Ryla thinking of everything they had to talk about, eager to rekindle their fire. The time came…and went. She waited longer and longer. It was obvious that he was not coming. Standing there by a river in a rather stunning dress she left their designated meeting place sad and confused, the moonlight reflecting her tears. As she walked, her thoughts turned more hysterical, soon she was running through the academy, she stopped when she heard two voices. Peeking around a corner, she saw her boyfriend, dressed nicely, talking and laughing with another girl in Ryla’s communication group; her best friend. She couldn’t believe her eyes; a blind rage filled her sad heart. Not only had her beloved been cheating on her, it was none other then with her best friend. She ran away back to her room, grabbing a pistol her boyfriend had been teaching her to fire, Ryla was a rather quick learner with the weapon. Returning to the scene, she turned the corner and shot them both dead without saying anything. Such an act obviously ruined what would have been an illustrious career for Ryla, but there was one thing that was worse to this whole event. Both in his pocket, and on Ryla’s desk were two notes written by him explaining his intentions and how sorry he was for how busy he had been. He wondered ‘if it would be okay if she came to meet the two of them to which he would then take all three of them out for dinner because he knew how much she also liked her friend and had been neglecting hanging out with her’. In a tragic irony Ryla who had been such a bright star in the communications officer candidate pool, had killed someone because of a failure to communicate. In a blinding resort to violence that ruined her life, she swore off violence forever more. Personality: One of the most caring woman you are likely to ever meet. She never talks about her dark past, and anyone who knows her general repulsion of violence either attributes it to the books she constantly reads, or to some sort of physical abuse she might have suffered. Ryla is the type of the girl that looks out for you probably better than you might look after yourself, capable of perceiving danger far sooner then anyone else. She is very skilled in her job, a direct go-getter that brings any crisis to its immediate successful conclusion. She has a deep drive within her to survive at any cost to continue living as a retribution for the dark mistake she had made a long time ago. 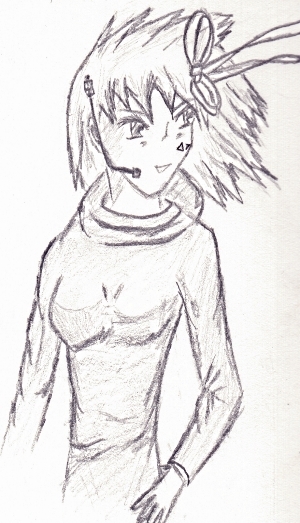 In the Reiko-10 game, Ryla is the only character that cannot normally fight. One of her final level skills ‘Angel of Death’ lets her attack without missing.